1. Start with loose hair. 2. Section off the amount of hair you’ll need for your braid and clip the rest of your hair back so it’s out of the way. 3. Start french braiding your hair. With a dutch braid, instead of gathering hair and placing strands over each other, you olace strands under each others. 4. Continue to braid across the front of the head where your bangs be until you reach the other side. 5. 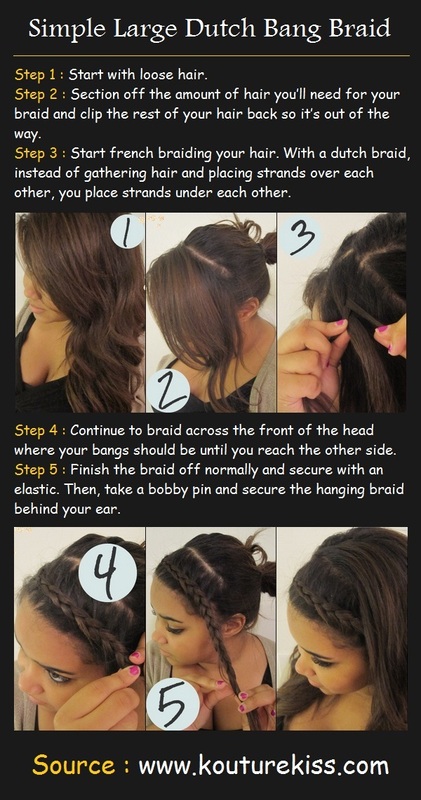 Finish the braid off normally and secure with an elastic. Then, take a bobby pin and secure the hanging braid behind your ear.